As these economic times make clear, one man’s trash is another man’s treasure. Recycling and reuse have inspired a new wave of eco-chic, injecting sustainability into both the language of everyday life and the palette of the craftsperson. 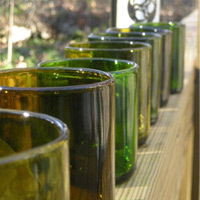 What material comes more easily to wine lovers than empty bottles? Reuse can be as simple as filling with tap water, and voilá, it’s a pitcher. Insert a rose—it’s a votive vase. Some gardeners counter a hot dry day by filling empty bottles and sticking them upside down in flowerbeds, where the water slowly percolates from bottle to soil. 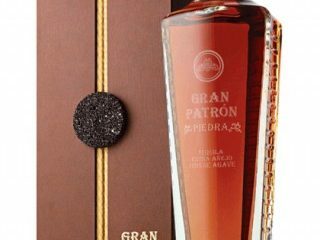 In the hands of crafters, though, the bottle takes on dramatically different forms. Uniquely hued tumblers draw attention to the surprisingly thick glass. Flat is beautiful when a single bottle is transformed into a cheese board or olive server. For the DIY types, this torch is another bright idea. 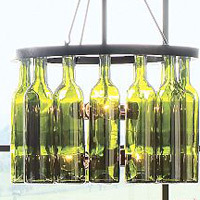 Chandelier and pendant lighting, meanwhile, play with the jewel tones of the glass; Pottery Barn offers a version that gleams when placed near a bright window to catch the sun. Reuse goes macro in chic restaurant settings, from a mosaic-like arch at Javier’s Crystal Cove in Newport Beach, California, to a trippy back-lit bottle wall at Morimoto, a restaurant in New York City. Wine bottles reach their maximum level of domestication at the Bottle Houses on Prince Edward Island, Canada, a playful interruption of the pastoral landscape. 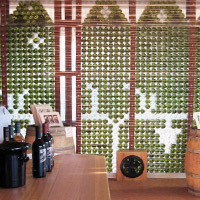 While these are mere follies, wine bottles as true building blocks have become a reality at Random Valley Organics winery, located in the Margaret River region in Western Australia. They recently received a grant to test the thermodynamics of using wine bottles filled with water to insulate new construction. 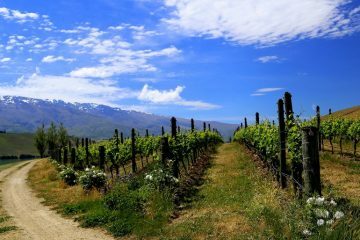 Their Cellar Door outlet is fabricated of recycled materials, a practical approach that’s as sustainable as it is beautiful. — Shireen Qudosi enjoys looking at wine’s environmental side in her work at Air-n-Water, specializing in thermoelectric wine cellars. You’ve given me some ideas for these jars I have. With some tea candles, I think they’ll illuminate my living room wonderfully. I didn’t know that trick about the bottles filled with water in the garden. I’ll definitely be using that one! Those are some really cool ideas!! I love the one from Pottery Barn, that’s just awesome. Thanks for the ideas!